Join the enchanted toad prince on his quest for freedom and casino slots free spins in this royal 5 reel. Spin the wheel to launch yourself from the Lilypad and strive to get a kiss from the beautiful princess. 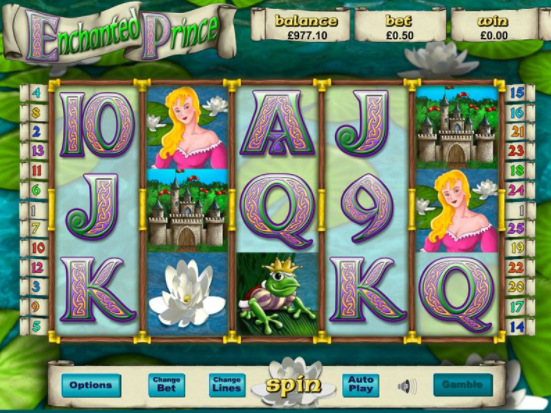 Filled with 25 pay lines and exciting bonus Wilds the Enchanted Prince is an online slot not to be missed. Spin slot games today! With two decades of creation behind them, Eyecon has been delivering charming online slot titles to the market since the end of last century. With an eye for artistry and intelligent design, some of their earliest releases are still popular many years on. With this wonderful heritage at their core, you can guarantee that their latest titles will also be top notch! With a classic fairy-tale theme and a Jackpot of 2400 coins, Eyecon’s Enchanted Prince is a 5 reel, 25 pay line online slot that can dance us delightfully towards an array of enraptured riches. From £0.25 to £12.50 per spin, we can spin the reels of this fantastic, fantasy game. In an opulent castle, in a faraway land, lived a fairy princess, who somehow had the instinct within her to know that by kissing an unusually charismatic frog, that it would be transformed into the love of her life – a handsome Prince! Thankfully, the riches that lay within Enchanted Prince are much simpler to come by (i.e., we won’t have to kiss a frog!). What we will have to do, instead, is find a range of symbols, from the 9 through Ace card symbols, to the Ruby Heart, Water Lily, Castle, and Princess – the highest value symbol in the game. Finding 5 of the Princess symbols will trigger the jackpot, while 5 of the Castle is also a high-value symbol, with an 1800 coin reward for 5. If you're interested, more EasySlots promotions are shown here. There is also a Crown Wild symbol, which can substitute for any other symbol on the reels other than the Scatter – the charming Frog himself. 3 Frog symbols will trigger 15 Free Spins, with an extra 5 Free Spins per additional Scatter landed. This Bonus Feature can be retriggered a great number of times, and with a 2x Wild regularly landing, alongside a winning payout equivalent to 5, 10, or 50 times our stake, depending how many Free Spins we have, the wins can quickly add up during this round. The graphics and audio in Enchanted Princess do let it down slightly, and they don’t seem to have added an original twist to the narrative of the classic fairy-tale. However, it is certainly a charming slot game, full of bright colours, happy characters and a decent return of wins. The number of Free Spins we can receive make it a good game for getting guaranteed wins – once we reach the feature – so it’s a nice game to take a change on from time to time. Click here to learn more about mobile billing slots on this site. Eyecon’s fairy-tale themed 5 reel isn’t the most complex, or graphically brilliant, but it does have the charm of any other fantasy-themed slot game out there. It’s bright, fun, and does everything we’d want in an online game. There is only one Bonus Feature – but what a Bonus Feature it is! 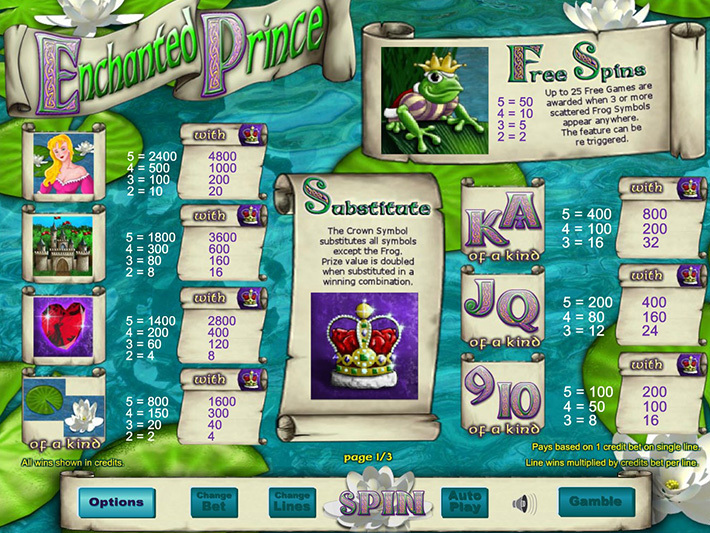 Up to 400 Free Spins can be played at once, which makes Enchanted Prince a great game to gain great wins. 8/10 from Easy Slots. Check out our popular slot game here: EasySlots.com or Discover more slot games.